Journalist Adam Higginbotham writes for The New Yorker, The New York Times Magazine, Wired, GQ, and Smithsonian. He lives in New York City. 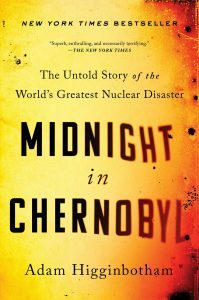 To get a book signed, Midnight in Chernobyl will be available for purchase at The Ukrainian Institute the evening of the book talk. By purchasing a book from the UIA, you are supporting its continued cultural and educational programming and the further enjoyment of its unique events by our friends and community along New York’s Museum Mile.